This is Mary Etta Goebel Carey's father as mentioned in the Ralph and Mary Carey Story. Photo and obituary provided by Pattie Atchley. "Frank Goebel was born in Scranton, Kansas, March 23, 1863 and departed this life at Hardtner, Kansas on March 6, 1947, aged 83 years, 11 months and 11 days. He was united in marriage to Eliza Culbertson at Lyndon, Kansas on February 10, 1890. To this union three children were born, ... Mrs. Etta Carey, Wheatland, Wyoming and Lester Goebel of Leroy, Kansas. the wife and daughter Bessie May, preceeded him in death both the same year, 1897. 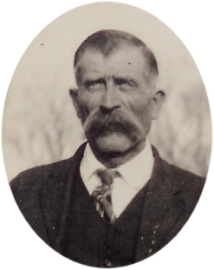 In the year 1893 he went to Oklahoma where he homesteaded on a farm in Fritzlen Township, Woods County where he reared his family and engaged in farming. He still owned the homestead at the time of his death. Known as "Doc" to his neighbors and friends he will be missed as he always had a cheery greeting for everyone. He was a kind and loving husband, father and brother, very patient during his illness and thoughful for other when needing their services. He was laid to rest in the Fairview cemetary Sunday afternoon..."
Visit the Carey Links page to see photos of original census showing our ancestors.